When the goal is glass-tiled perfection, says Jimmy Reed, there's no substitute for the hard work that goes into ideal surface preparation. And that's especially true when, as in the case highlighted here, the project involves resurfacing an old, deep pool and its odd set of coves. In my career, I’ve applied lots of fine finishes to swimming pools, spas, fountains and other types of waterfeatures. 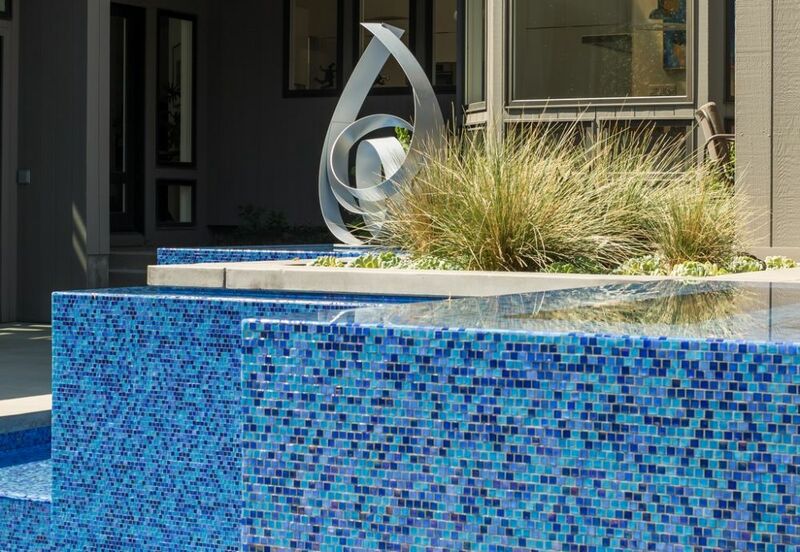 Most often we work with glass tile, but we also keep our hands in a variety of ceramic or porcelain tiles, various mosaics and, generally, what most would call classy, top-flight materials. No two projects are ever quite the same, but the procedures we follow are: In every case, we at Rock Solid Tile (Calabasas, Calif.) end up having to work through imperfections in the concrete shells left for us by builders and their concrete crews – and that’s true even if they’re experienced and have done all they know how to do to smooth the way for us. If we’re brought in early enough, we can work with the steel and concrete crews to get the walls set up the way we like, with good vertical surfaces, squared transitions and reasonable slopes. If we come in late, we make do with what we get. Either way, however, we spend an amazing amount of time in preparing the surface to accept the tile. We’ll put on a waterproofing agent, lay down a full layer of thinset and then apply a mortar bed floated to meet the exact set of measurements we’ve established. Our goal is to work without cutting any tile, particularly not in places where breaks in dimensions, profiles and patterns might be noticeable. It’s intensive work, but it’s what we do daily. So we hack away at raw concrete steps, shelves, edges and benches, grinding surfaces down so that contours are consistent and the radiuses allow for elegant sweeps of tile. Or we build surfaces up if they’re low, pushing and pulling at them until they’re as smooth and perfect as we can make them – so much so that by the time we’re done with our preparations, the actual process of laying the tile is pretty straightforward. The project depicted here shows what happens when we pursue perfection in this way – in this case, in a remodeling job. The site we were called to is in San Marino, an affluent enclave near Pasadena, Calif. 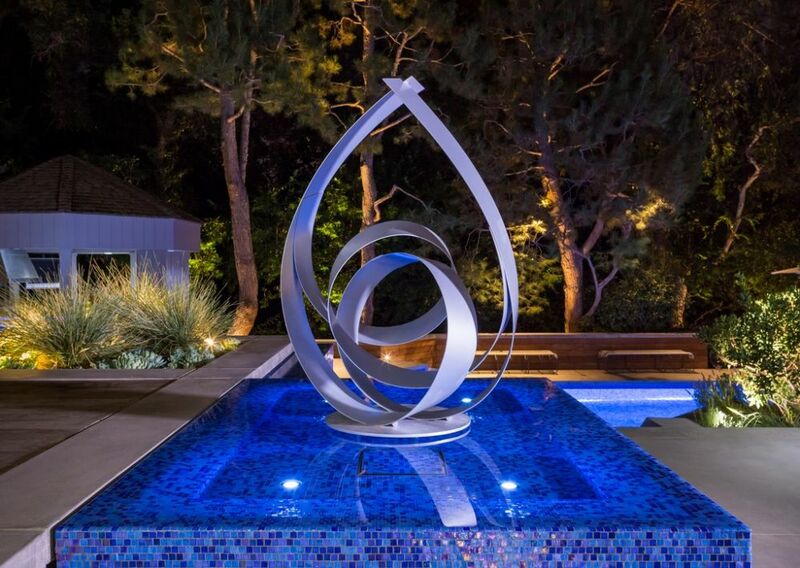 The owners wanted a cleaner, more contemporary look for their pool and spa – something to harmonize with a beautiful Modernist sculpture intended to highlight the transition from the interior space to the exterior. The design came through Alison Terry (Terry Design, Fullerton, Calif.), with the watershaping managed by Dave Penton (Fluid Dynamics Pool & Spa, Fullerton). Rock Solid Tile was engaged to take care of the tile surfaces. Once the pool shell had been stripped and the brick facing and detailing removed, we could see all of the waves, ripples and inconsistencies of the surface and set about creating truly vertical surfaces as well as coves with a consistent sweep. By the time we started applying tile, all of the dimensioning was perfect and we had crafted a surface meant to display the tile at its best. To update the overall look, the old spa’s spillway detail became a perimeter-overflow system. The brick steps and brick-framed planters and raised bond beam were stripped, reworked and completed in poured concrete. 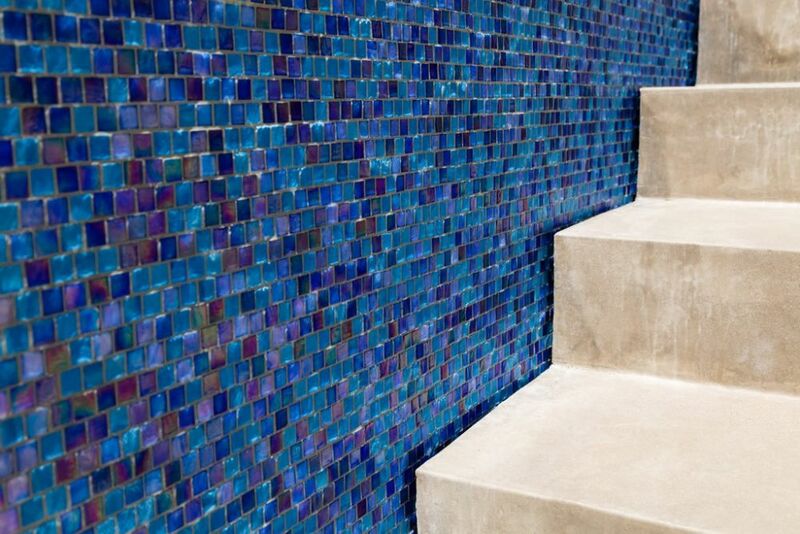 Quickly, it was on its way to becoming a much more interesting space in visual terms, and the homeowner’s desire was to cap it off with a vibrant blue tile that would run throughout the pool and spa and up along various walls. This was a case where nobody on the design team had any input or control over the way the stripped shell had originally been installed, but that’s not to say that, as part of the remodel, we weren’t able to address a few of its thornier contour issues. 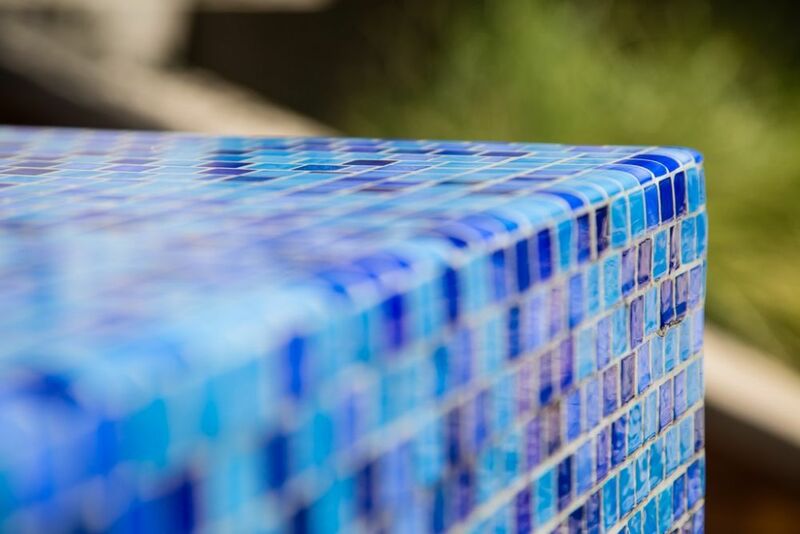 With the tile-application process nearing completion, you can see the precision of the lines, the consistency of the way we rolled the edges – and the value of the new bench in helping us define a new sweep for the coves at the bottom of the pool. It’s a massive amount of tile surface, and we knew in completing our work that it was as visually flawless as we could make it. 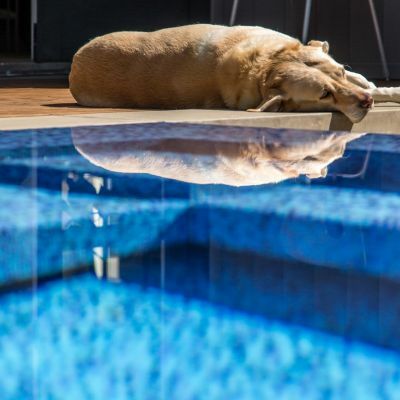 It wasn’t a big pool, but it was old-school deep and had broad coves that followed inconsistent curvatures – a nightmare with an all-tile finish, which shows off any sort of irregularity in the loudest possible way. We knew we couldn’t eliminate the coves and square off the floors and walls the way we might have wished we could; what we were able to do was add a bench along one long side of the pool that gave us control over a key, long section of the cove we used to set the pattern for the rest of our work in filling and reshaping the coves in the rest of the pool. Ultimately, the addition of the little bench let us perfect our approach to the project. Given the small size of the pool, there was actually a huge tiled surface: The multiple planes rising above the deep end added up to a lot of exposed wall space, while the unusual depth of the pool (by today’s standards) added even more tile below the waterline. 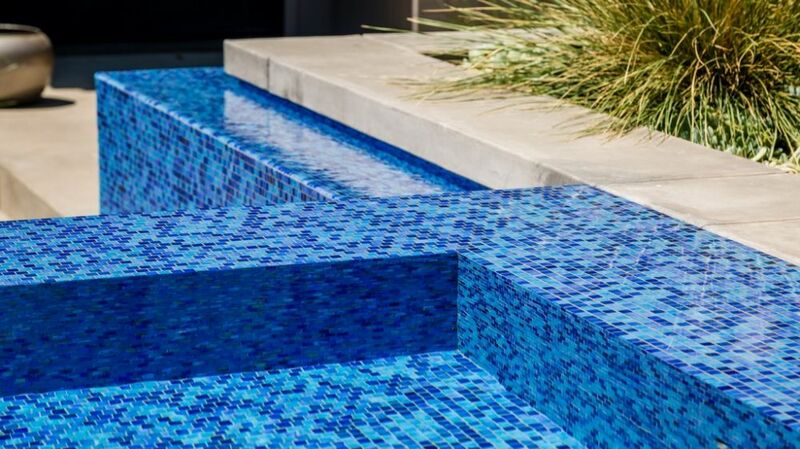 But because we’d taken control of preparing the inside of the pool to match up with the specific tile we were using, the work of applying all of that square footage moved along rapidly. 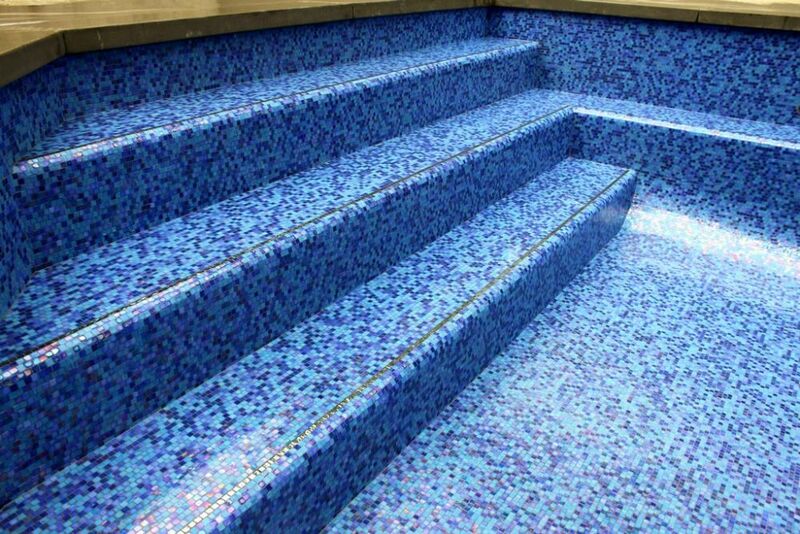 For us, the key to taking good projects and making them extraordinary is our use of what we call “signature details.” We take great pride in carefully rolling the edges of steps and benches, for example, grinding the concrete down to achieve the perfect shape and then applying our tiles so there are no visual breaks in any of the lines. With perimeter overflows, that sort of precision is of even greater importance: These are projects where any visual break or, far worse, the slightest inconsistency of flow over the edge stands out like the sorest of sore thumbs. Again, we grind and polish these stretches until they are perfect and it takes no more than a minimal flow of water to keep the edge wet. As I see it, remodeling projects such as this one offer challenges that don’t arise with new construction – particularly if we get involved early enough in a new one that the shell is shaped to meet our needs, even if approximately. But I’m also of the opinion that, when you get right down to it, every project we tackle is about surface preparation, measurement, planning and execution – and that’s something we get as involved with in new work as we do with remodels. It’s all in the mindset: With every project of any description, getting the surface ready is the key. You can’t achieve the level of precision and perfection we pursue every time we go out on a job without adequate, thorough, thoughtful preparation. We wouldn’t have it any other way – nor would our clients. Jimmy Reed is president of Rock Solid Tile, a tile design/installation firm based in Calabasas, Calif. He founded the company in 1985 after spending his teens and early 20s learning the tile-installation trade. In between, he attended Art Center College of Design (Pasadena, Calif.) and spent several years working in the entertainment industry. For the past 20 years, Reed has focused most of his creative energy on designing and installing tile finishes for high-end custom watershapes, a process that has seen him work with some of the industry’s leading designers and builders. He may be reached through his web site: www.rocksolidtile.com. Beautiful work, Jimmy and Dave.